Jumpin' Jim's Ukulele Island. (31 Tropical Tunes Arranged for Uke). For ukulele. Fretted. Hawaiian. Songbook. Uke tablature. 80 pages. Published by Flea Market Music. With uke tablature. Hawaiian. 6.75x10.5 inches. 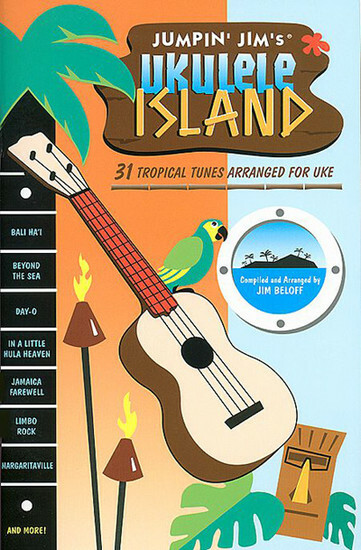 A fun and refreshing potion of 31 tropical songs arranged for uke. Chock full of sambas, calypsos, Hawaiian classics and exotic tiki tunes, Ukulele Island is a vacation in a book! Includes: Bali Ha'i * Beyond the Sea * Day-O * Don't Worry, Be Happy * The Girl from Ipanema * Jamaica Farewell * Limbo Rock * Margaritaville * One Note Samba * more! This 80-page songbook also includes suggested strum patterns and a chord chart.